This guide is meant for people that just heard about NOAA satellites, that just saw somewhere that you can receive images from satellites quite easily and cheap. Read this get started. This is a guide about how to receive images, if you want information about how to use noaa-apt check the Usage page. NOAA images are black and white. People on the internet share color images, those images were originally black and white and then were colorized, probably by WXtoImg. NOAA images don’t have map lines (divisions between countries, states, or coastlines). When you see on the internet images with lines, it means that they used WXtoImg to draw them according to a map and calculations about the position of the satellite when the image was taken. The images are upside down 50% of the time, that’s because the satellites sometimes go from south to north and sometimes fron north to south. WXtoImg calculates the orbit of the satellites and rotates the image accordingly. Images look much better on daylight, the satellites also send infrared images but I recommend midday passes. These satellites send images at realtime, line by line. Something like a 1000x1 resolution video or like a flying image scanner. These satellites fly on a polar orbit (north to south and south to north). The satellite sends a FM signal, something like FM broadcast radio transmissions. Instead of music it sends images, but it works exactly the same. You can imagine that if your car stereo could tune to 137.1MHz you should hear the satellite transmissions. That’s also why you can save the recordings as .wav files and decode those .wav files with this program, because it’s just a sound that encodes an image. If you want to know more visit How it works. You need a RTL-SDR, it looks like a USB drive but it has a connector for antennas too. You can try first with a V-dipole antenna, RG-58 coax cable and adapters. Later you can improve reception if necessary building a Double Cross antenna or a QFH antenna. 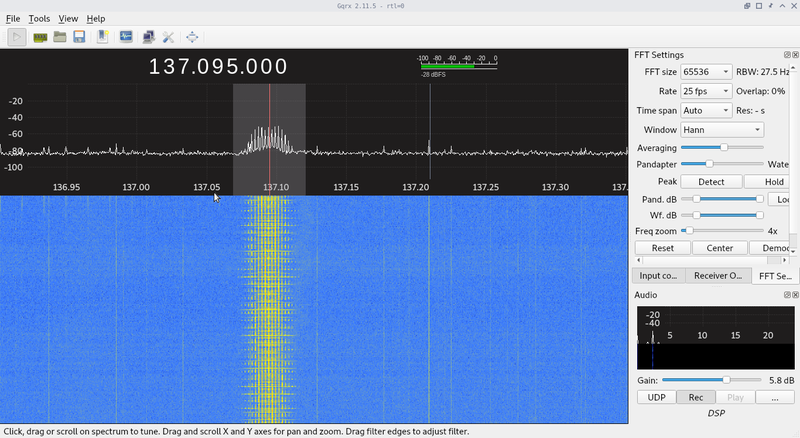 First you have to download some SDR software, for example GQRX (GNU/Linux) or SDR# (Windows). With it you can tune your SDR to any frequency and demodulate FM signals, try it with broadcast radio first. To track the satellites positions you can use for example gpredict (GNU/Linux) or Heavens-Above (online or Android). You should look for passes during the day with at least 10° of max elevation. I use the following configuration on GQRX. I don’t know if these are the best settings, but it should work. Demodulation: WFM (Wide FM, mono). Filter Width: Custom, just wide enough so the signal fits as you can see on the spectrum analyzer. LNA gain: Max, but you can play with it and guess where it has the best signal to noise ratio. I don’t use any of “DC remove”, “I/Q Balance”, etc. When the satellite is passing start recording a WAV file, you should hear the sound of the demodulated FM signal. When finished open the WAV file on noaa-apt to decode the image. I have “Freq zoom” at 4x so I can see the signal better on the spectrum analyzer, these signals have a very narrow bandwidth. The signal should fit inside the filter bandwidth (grey area). I’m recording the WAV file (the “Rec” button on the bottom right is pressed). Example of a WAV file, hear it, near the middle of the recording you can hear the ticking sound of APT signals. You don’t need a LNA or a high antenna. I’m using a Double Cross Antenna, roughly 2m above the ground and 3-4m of RG-58 coax. Probably helps being far from big cities. Its not necessary to compensate doppler shift. Resample the recording to 11025Hz, you can use noaa-apt for that. Enable Expert mode, on Options > GUI Options. File > Load audio file. Select Options > Disable map overlay because it’s going to be wrong unless you correct the timestamp of the file.